British adventurer and extreme athlete Ash Dykes, from North Wales, has just arrived at his second major milestone during Mission Yangtze, as he attempts to create history with a third world-first record, this time walking the entire 4,000 mile length of the Yangtze river in China – and he has been reassured to see the river has so far remained unaffected by plastic pollution. Ash has reached the first major bend in the river, its southernmost point, where it takes a sharp 90 degree turn and flows to the northeast in the province of Yunnan, the third province Ash has entered, having previously trekked through Qinghai and Sichuan. In the first 11 weeks of the adventure Ash has already completed 1,500 miles of the 4,000 mile journey, putting himself well within reach of his goal to complete the expedition within a year. Having begun at the scientific source of the river, at over 5,000m above sea level, Ash is now just below 2,000m above sea level. “It’s been a wild adventure and more extreme than I could have ever imagined. How has Ash coped with the early stages of the mission? At the mission’s start, high on the plateau, Ash faced mountainous terrain including snow blizzards and -20 degree Celsius temperatures, bears migrating down from the mountains for their winter hibernation, wolves, and the vulnerability of long periods of isolation. Ash has been keen to get involved in the locals’ way of life, helped by his fast-developing language skills. Recently, he has worked paddy fields, cared for fruit and vegetable plantations, and helped local farmers with livestock such as pigs, chickens and cattle. It has been interesting seeing how the younger generations are utilising new technologies and influencing the ancient, traditional ways of their elders. Over the next 500 miles Ash will see where rural China meets urban China and how they integrate with one another. Of particular interest for Ash personally will be the environment. “Protection of the environment is very close to my heart and I always push out the message that you must enjoy this planet we live on, but also protect it. 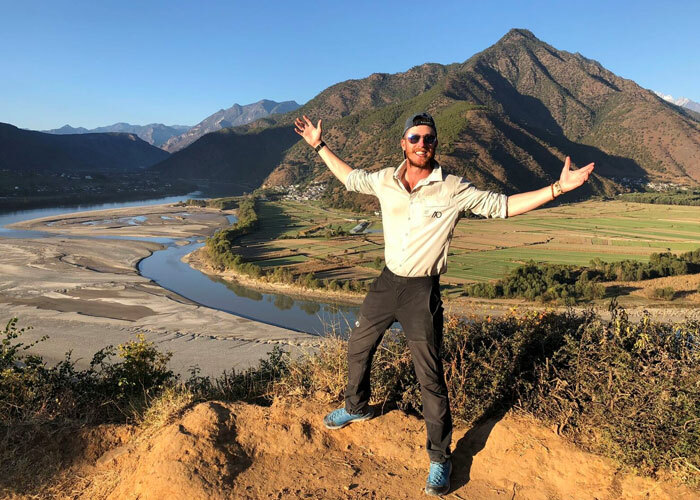 “So far I’ve been keeping my eye out for plastic pollution and I can honestly say I’m surprised with how well cared for the Yangtze River and the tributaries that flow into it actually are. I’ve not seen much plastic in the waterways up to now. Ash believes that the reason for the lack of plastic pollution is that it is relatively new, and calls for education to ensure inhabitants are aware of the damage plastic can cause, with many assuming plastic is biodegradable. “They only need telling once. As soon as they’re aware of the harm it brings to nature and the wildlife within, they’re the best at making a change and finding an alternative. These are people that if they discard of their hot water, they throw it in the air first, for the water to cool down before hitting the ground – in case they harm insects living in the grass! Ash has been keeping everyone posted on social media and continues to grow a huge following with fantastic engagement, sharing everything he comes across in real time. People can even track Ash on his website and see where he is, within 5 metres of his actual location. Mandarin Films (Ash’s China-based production team who are creating a documentary of this expedition), are soon to release one minute teaser clips every week. This documentary coverage is heavily anticipated in the Chinese market and is expected to be popular in international markets too.